These deposits are so immense that even after decades of fossil collecting, bones are still sticking out of the ground. The Karoo formation is a water deposited sediment bed up to 20,000 ft thick and covers nearly 200,000 square miles. Massive fossil graveyards of dinosaurs exist all over the world. The Morrison beds in North America, (covering thousands of sq. miles), the dinosaur beds in Montana, Alberta, the Dakotas, Colorado, Utah, Africa, Europe and China, etc., etc., contain literally millions of dinosaur fossils piled together in heaps and mixed with other creatures. Ten thousand Hadrasaurs were found on Egg Mountain alone, including all age groups and eggs jumbled together in a mass death. Would this happen under normal, uniform conditions? The answer is No. Think about it, they are all in water deposited sediments! The Buffalo Question- Millions of buffalo were slaughtered on the North American plains during the last century, so multiplied thousands of fossil buffalo should be common, but are any great buffalo fossil graveyards to be found? No. Their remains were disposed of by the normal ravages of weather, scavengers, and decomposition. So why are there great fossil graveyards of dinosaurs and thousands of other species, where the bones of these beasts lie entombed in heaps, together with fossilized mammals, fish, insects, plants etc., testifying that they all perished together in a mass death? How to make a "Fossil"
Many Fossil beds uniformly contain undersea and terrestrial animals and plants buried together, just as one would expect if deposited as a result of a flood. Others mix many types of animals normally not living together within the same ecosystem. Fossil beds consistently never contain transitional forms, a long standing misconception advanced by evolutionists in the textbooks. These falsely illustrate bones that are found from widely different sites and are lined up to support evolution theory in a pick and choose fashion. 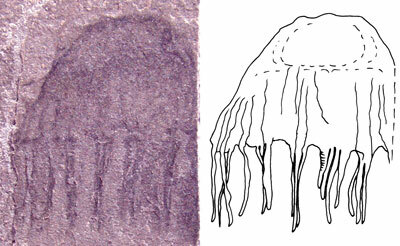 See Fossils Show Stasis and No Transitional Forms for more. Despite this effort, 1/2 way forms are absent, just like we see them absent today. I posted this question to one the most prominent Zoologists in the world in 1991, Dr. Collin Paterson of the British museum in London, and he responded; "my colleges in the tropics tell me the same thing! The conversation started with my comment that no "in-between" types exist in Alaska also. If evolution were true, many, many in-between or "transitional" types should be present in the world today. They are not. Anyone ever report a hairless walking chimp find in Africa? No! Besides, the DNA and cell mechanism prohibit such development. See The Question of Data - Genesis Alive! and The Question of Complexity - Genesis Alive! posts. "Fossils are an embarrassment to evolutionists" - Dr. Gary Parker PhD. A cave was discovered by local treasure hunters on the lower slope of Bishops cap by a Mr. Roscoe Conkling of El Paso in the 1920's. Intrigued by its soft floor, a party was formed and excavations began in the presence of a recognized authority who could witness the potential unearthing of items of importance. Digging down through the layers, animal bones now extinct began to be exposed and removed, then suddenly a human skull cap appeared at the 12 foot level. Further down the sediment layers a hard lens was encountered, and when broken through was found another skull and remains of numerous other animals including a camel nearly 21 feet in depth. The scientist commented that this find was of national significance, but for one reason or another, never got into the textbooks. Alfrend Rehwinkle in his volume The Flood, 1951 (See Corless Handbook of Geological Enigma's Sourcebook Project 1980 p. 668-9) relates this type of phenomena is not isolated, there being documented discoveries in England, France, Spain, Germany, Greece, USA, Russia and Malta of these same deposits. For example, in Greece on the Island of Cerigo, there is a place called the "Mountain of Bones" being 1 mile in circumference. In Burgundy France, is found a steep promontory 1000 feet above the valley floor. Looking skyward is a natural fissure filled to the brim with the broken remains of bears, foxes, wolves, horses, oxen and other animals. Such a deposit was surely made by waters passing over the top of the edifice, these parts settling to fill the crevasse. Similar deposits exist in the British Isles and Sicily, the latter where more than 20 tons of bones were mined out for commercial purposes. On Gibraltar, fissures in number reach over one thousand feet high, full of animal bones, and in one place, claimed human artifacts. Near Odessa, Russia, a cavern was found full of animals such as cat, hyena, horses, boars, mammoth, rhinoceros, deer and smaller animals such as rodents, hares, martens, otter, wolves and foxes all mixed together in no order. This not to mention the 4500 bone remains of bears! Upon close examination of all these deposits we find that very few complete skeletons remain, disproving these deaths being accidental. We must consider their occurrence being a direct consequence of the Flood. More evidence of high water deposition is found detailed in the fossils section in this volume. Chemical and Engineering News 54:4 Oct. 11, 1976, See Corless Handbook of Geological Enigma's Sourcebook Project 1980 p. 643 and Snelling, PhD, Creation Ex Nihilo Technical Journal, Vol. 9, no. 2, pp. 244–258, 1995. While mining in a pit near Lompoc CA, workers uncovered an 80 foot Baleen whale entombed vertically in a pit depression structure. The fossil was found in the presence of many other marine fossils. Whale deposits in groups have been found in Oregon, Peru and recently in Norway. These mixed with various marine mammals and reptiles, each signifying a catastrophic and not a gradual end. 1. Oregon Fossils, Orr & Orr 2009, p.103, 196-201, 223. Along the Arctic coast, naturalists found thousands of mastodons laying out in the tundra, in Siberia, entire islands were made of bones and carcasses of the animals and many were found intact and washed in jumbles by the millions. In Antarctica, fossil beds abound. In California, petrified fish, fossilized with mouths open, backs arched and fins spread, have been found. Many of these fish are partly on end with the body passing through two planes of rock-strata. By modern geology this would mean that the fish-tail is separated from its head by millions of years. That, of course, is not possible. There are approximately five fish per square foot over approximately four square miles. This equates to more than one billion fossilized fish! These graveyards are dramatic evidence that an era of the world ended with enormous violence world-wide in scope. Many Geologists and Paleontologists have an innate distaste for catastrophism, and that's understandable, Catastrophists easily identify every strata of sediment with a worldwide flood, layer upon layer in the rocks. The author experienced this in college geology classes, when professors were presented with this evidence they abandoned uniformity! See Grand Canyon and Last Mountain Standing this series. Mr. T-Rex here has been unearthed in soft tissue! T-Rex in soft Tissue! 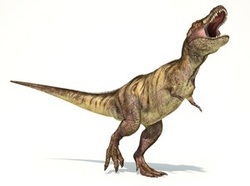 Tyrannosaurs Rex, the most popular Dinosaur in the world touted to have lived over 70 million years ago have been found in soft tissue. This Wyoming fossil has upturned the evolutionists Geologic chart as not so "logical" anymore. Red blood cells could be clearly viewed using a thrift store microscope! Many so called ancient creatures have also been unearthed in soft tissue. The Plesiosaur, the most common large marine fossil in the world, found buried in flood deposits thousands of feet high in the mountains? These animals were fist uncovered in England in the early 1800's. In a picture of the recent Montana find, the skull is in cased in a sandstone block. Scientists immediatly dating the surrounding "loose soil" at 75 millions years old, though none came with a dog tag saying, "I died 75 Million years ago". How do they know? Of interest is the water sediment burial common to all Plesiosaur fossils found around the Earth, in fact, these creatures initiated the hunt for dinosaurs in general due to their abundance. Noteworthy is one Plesiosaur found in Kansas (1) carrying a young pup, (perplexing to evolutionists, who assumed these marine reptiles were egg layers), and two very recent findings, one two near Livingston, Montana and another near Mitchell, Oregon (2) both were located at high desert altitudes over 4000 feet! Think of a watery catastrophe so massive as to catch a 25ft long Plesiosaur and preserve it in mud/sand in the mountains! How do any of these finds not support a massive flood event? 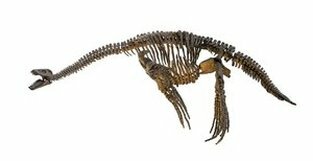 More Plesiosaurs - a new find near Grand Prairie, Alberta Canada made the headlines but not the science classes. This one was found in the high prairies at 2,100 feet. Scientists commented that they were stunned and amazed and didn't know how to respond to this finding. The largest known Plesiosaur was found in NE Mexico at 3,200 ft and was 50 feet long. All these were animals were killed and fossilized by sediment filled, moving water. Why did evolutionary paleontologists date the 'mud' layers where these animals were found as 75 million years old? Mainly because they contained the Plesiosaur they say lived at that time frame according to the chart of evolutionary time, not based on some outside method of dating! Think of it, how can you catch a live Plesiosaur and quickly cover it in sediments? Like the soft body Mosasaur found in South Dakota in 2010 (1), all have been rapidly buried, died, and then later exposed as uniform erosion has exposed them. 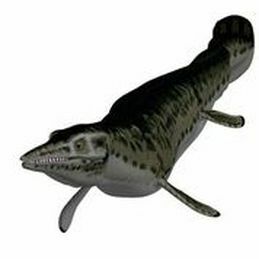 Actually, if we compare this Mosasaur to the Mammoth soft body finds in Siberia and Alaska, they exposed in identical ways, why are the Mammoths dated only in thousands of years and the marine reptiles 80 Millions of years past? Who makes these determinations, are they taking into account soft body tissue and known decay rates into consideration? Who ever heard of soft body tissue surviving more than a few hundreds of years in thawed sediment? When fossils don’t fit the established dogma of evolution, explanations of "amazing", "unbelievable" etc. are used to excuse their out of place position and suggested oddity, not to be included in an overall and more accurate picture of true origin science. Our Dynamic Duo return, from Saudi Arabia? So back to Fossils 101. As water burial and quick covering by sediments is the only known method to produce a fossil, here evolutionists hope to control the definition of fossilization and suggest a local deposition. But It's no simple task to catch a live Plesiosaur or Mosasaur then get them to cooperate while being buried alive, quote; "a pile of sandstone and conglomerates (pebble-rich rocks) deposited by streams and rivers" ! Of course they assume you believe one day one of these 25 foot long creatures just fell over dead and sank, then was left intact and untouched for years being slowly covered by some stream without any scavenging or scattering of the remains! Such preservation has never occurred in observation anywhere, so the only possible explanation is that these creatures were covered by catastrophic means. Truly, considering the magnitude, variety and quantity of fossil deposits found around the globe from the Arctic to Antarctic, Australia to Arkansas and Russia to South Africa, a story is told among the heaps of dead. One interpretation says these deposits happened randomly across the eons in local events; another most all occurred in one world-enveloping event that 4 chapters of the Bible are consumed to describe. The basic elements of the Catastrophe are also recorded in over 100 history accounts of peoples and cultures of the past from around the world. As no one has observed fossils deposited stacked like this anywhere in any recent event local or other wise, looking at the sum of it is compelling. As of this writing, the world fossil grave yards exceed 1 million in number, so many that maps from every continent are so full of these graveyards individual resolution is difficult to provide information on their specific locations. Evolutionists often mention that if the Bible is true, where are all the human fossils left from the flood? Just offshore of Guadeloupe, in the West Indies, lies a formation of limestone dated as Miocene, or about 25 million years old. However, history records show that in the late 1700's many human skeletons---all indistinguishable from modern humans---were excavated from this limestone. One of the quarried specimens, ensconced in a 2-ton slab, was shipped to the British Museum where It arrived in 1812 and was placed on public display. But with the ascendance of Darwinism, the fossil skeleton was quietly spirited away to the basement. The discovery of these human remains has been well documented in the scientific literature. In many places around the world, human remains have been found behind walls in sealed caves, could these have been people trying to escape the flood waters? Now if you were someone who new a flood was coming, what would you do? Most likely get into a boat or go to high ground. Neither place would provide much of an opportunity to be buried. Besides, mammals sink then float and disintegrate, reptile drown and sink. Maybe that's why we see far more reptiles like dinosaurs in the fossil beds. Human remains huddled to gather in groups, fragments, skulls, femurs and every body part have been uncovered all over the world. They come out of hardrock and coal mines, sealed in caves and every other condition imaginable. Hidden from the public view for decades, two daring scientists have dared to expose the back room of anthropology in the recent book Forbidden Archeology authored by Micheal Cremo and Richard Thompson now in its 15th printing. Their work also document page after page of relics from a society of pre-history, including tools, ceramic ladles, pots, dolls, images, signage and metal extrusions unearthed in deep strata across the globe. These articles are exactly what we would expect to find if there was a would wide flood. For more see page this site Flood Artifacts. To summarize, the Bible teaches that the entire world was inundated and destroyed in a Global Flood, so what evidence would we expect to find? The Hydroplate Theory - The Flood ( Newer version! ) - YouTube 10 min.